Horowitz’s meta-mystery is a delight! He obviously gets great pleasure out of turning the murder mystery genre upside down, as proven by his last book, Magpie Murders. This one is totally different and even more of a joy to read. Horowitz knows murder. In addition to writing for various TV murder series, including Foyle’s War and Midsomer Murders, he has a string of killer books. This one is different from any of them, with Horowitz himself as the narrator. It’s a novel, alright, but the various Horowitz factoids sprinkled throughout are true. For example, he did write a screen play for a Tintin sequel for Steven Spielberg and Peter Jackson. It’s a refreshing and amusing approach. He’s not the detective. That would be the opaque and occasionally infuriating Daniel Hawthorne, a consultant to the police. Horowitz fills the Dr. Watson role, only he’s exceedingly ambivalent about his part and doesn’t really care much for Hawthorne. The mystery is complex enough to satisfy the most discerning fan but it’s the wit in the writing that makes this book so very special. The word is that Horowitz plans to make the pairing of his quasi-fictional self and Hawthorne an odd couple crime series. I certainly hope so. Ex-cop Daniel Hawthorne was a consultant for Horowitz during his writing of the television series, Injustice. Now Hawthorne wants Horowitz to write a book about him solving a murder case. He already has one to work on: an older woman made her funeral plans and was murdered only six hours later. That’s hard for Horowitz to resist. To learn more about this prolific writer, click here. 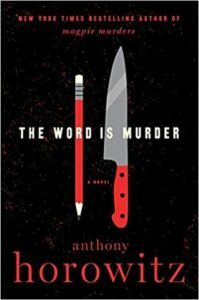 I cut thrillers a lot of slack: the characters and formula are largely predictable and I accept that. However, this book was a huge disappointment. Its concept ticked the right boxes — a group of people searching for a prior lost expedition in a dangerous and mysterious cave. The writing did not. Do yourself a favor and read Jules Verne’s Journey to the Center of the Earth instead. It’s quoted several times in this book and those were the best parts. Milo, a Georgetown history professor, becomes part of a team exploring a massive cave in Tanzania. The supposed goal is to find clues regarding the fate of an explorer from a century earlier. What they actually find is much more. For more about the author, his books, and whatever click here. Ondaatje had me at his first line: “”In 1945 our parents went away and left us in the care of two men who may have been criminals.” What followed did not disappoint. This story of two abandoned teens, their caretakers, what came later, and what happened before alternately beguiles and shocks. 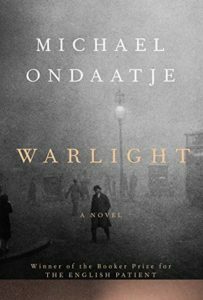 Ondaatje is a poet as well a a novelist, so outstanding prose and thoughtful writing are expected. What’s more interesting is the layers he adds and then peels away to reveal (or not reveal) facets of his characters and their actions. The title refers to the minimal lighting used during WWII in London; only enough to guide vehicles that must travel at night on the roads and Thames as well as mislead Nazi planes looking for bomb sites. That same dim lighting barely illuminates the shadowy activities and motivations of the vanished mother when her son begins to investigate. Nathaniel, also known as Stitch, provides the first person narration. When his parents leave for Singapore, he and his sister, Rachel, are surrounded by people they’ve barely known or never met. They engage in activities inappropriate for teens — or most people. They are unsure of everything, not unlike all of London, where rubble and bombed buildings are everywhere. The author lulls you with delightful prose about activities like fly fishing or greyhound racing, then drops a story-telling bomb. The exploration of these activities provides character insights in clever, unobvious ways. Then those shocks make you realize nothing is quite what you thought. However, this is not a traditional mystery or spy story. This book is not about the destination or a neat solution, it is about the journey. And, the journey is very rich indeed. Nathaniel and Rachel are left in the care of a strange man they call The Moth. Their parents went to Singapore for a year, but the teens soon discover this isn’t true. The what and where of their parents is a mystery — almost as mysterious as The Moth’s friends, who now surround them. As an adult, Nathaniel strives to solve those mysteries. And, understand why his mother did what she did. I did not quickly find a website for the author, but for additional information on him and his works, click here.